Is this the return of the failed ‘Bird of the week’ posts? Who knows? I won’t commit to a weekly bird post given that the last ‘Bird of the week’ was over nine months ago. I will, however, endeavor to post more about birds at more regular intervals. Today’s bird is quite a charismatic bird in terms of its interesting life history/survival strategy. These birds are brood parasites which means that they lay their eggs in the nests of other birds. 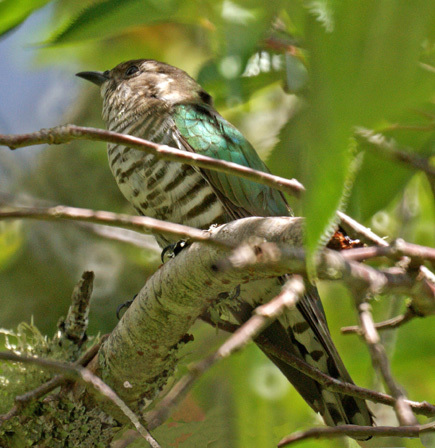 The bird is obviously the cuckoo, more specifically the New Zealand Shining Cuckoo or pipiwharauroa (Chrysococcyx lucidus). Shining Cuckoos are so called due to their burnished metallic bronze-green plumage. Easily identified by their aforementioned plumage as well as their distinctive high-pitched call, Shining Cuckoos are a relatively common species found inhabiting native forest, scrub, parks and gardens though out New Zealand. During winter they migrate to Solomon Islands and Bismark Archipelago. Although brood parasitism is found among other birds, among fish and insects, cuckoos are certainly the most famous of the brood parasites. This is most likely because cuckoos are typically interspecific brood parasites (i.e. they use other species as host parents). The Shining Cuckoo’s usual host is the Grey Warbler. Brood parasitism is more common in Old World cuckoos (~56 species) than in Old World cuckoos (~3 species). All of the former are members of the same family as the Shining Cuckoo, Cuculide, and all are obligate brood parasites. This means that they are ‘obliged’ to put their eggs in someone else's basket. However, whose basket is the question. One of the common strategies for cuckoos to get a host to sit on their eggs is to mimic the appearance of the host’s eggs. As mentioned previously, the Shining Cuckoo uses the Grey Warbler as a host. Therefore, under an evolutionary arms race scenario, the cuckoo would be under selection to produce better and better mimetic eggs and the host would attempt to counter this with some sort of anti-parasitism defence (note: do not interpret the scenario as teleological). We should therefore expect that a single species of cuckoo would have a singly host species. Interestingly, this is not always the case. Some species of cuckoos have several host species and the way they get this right is by having polymorphic eggs. This means that within a species of cuckoo, different individuals lay eggs that look different and mimic the eggs of a different host species. But how does this happen and why do some individuals have different eggs? The first question you would need to ask is how the females know which species has eggs that look like their own, and the second one would be why do females lay the same eggs as their mother if they mate with a male born to a female of a different egg type. The first question is relatively straight forward. The female is likely to carry some sort of imprint from the song and appearance of her surrogate mother making it easier for her to identify a host when she needs to lay her eggs. This is particularly important in areas where the different host species have overlapping geographic ranges. The second question has a remarkable potential answer. In mammals, males carry one X and one Y chromosome and females carry two X chromosomes. In birds, however, females carry one W and one Z chromosome and males carry two Z chromosomes. It is therefore possible that the gene related to egg colour determination in cuckoos is carried in the W chromosome. Therefore, it doesn’t matter what egg type male was born from, it is only the female that matters. Mimetic eggs are not the only way that cuckoos get away with brood parasitism. In some species the egg does not resemble the hosts’ eggs. How then does the cuckoo get away with it? Historically it has been suggested there might be lag in the evolution of the host such that there has not been enough time to evolve defenses or, the host is genetically constrained somehow and unable to evolve a defense. This means that the evolutionary arms race is in disequilibrium. A recent study of the Jacobin Cuckoo (Clamator jacobinus) and its host the Cape bulbul (Pycnonotus capensis) suggests that in this case it might actually be stable. This is an example of a non-mimetic egg host–parasite relationship because eggs of the Jacobin Cuckoo are almost twice the size of the eggs of the Cape Bulbul. Given this non-mimetic nature of the cuckoo eggs it would be easy for the Bulbul to recognise the imposter but the eggs are probably too heavy to eject from the nest and too thick to break open. Why does the Bulbul not just desert the nest in the presence of a cuckoo egg? Despite cuckoo eggs and/or chicks being present in the nest the author found that the fitness of the Bulbul was not reduced to zero. In other words some Bulbul offspring did survive to fledge in the presence of cuckoo chicks. Thus, if the Bulbul does abandon the nest its own chicks would die, effectively reducing its own fitness. This work is interesting because evolutionary lag has tended to be the typical explanation for the non-mimetic phenomenon among cuckoos. It also indicates the importance of questioning ideas carefully in science and not sticking to the status quo.